Shared workspaces are booming and transforming the working environment. At the same time, remote work is growing and expanding at the expense of physical workspaces. At first glance, remote work may seem like a more feasible and cost-efficient option for entrepreneurs or startups. But sharing space is beneficial for business growth. 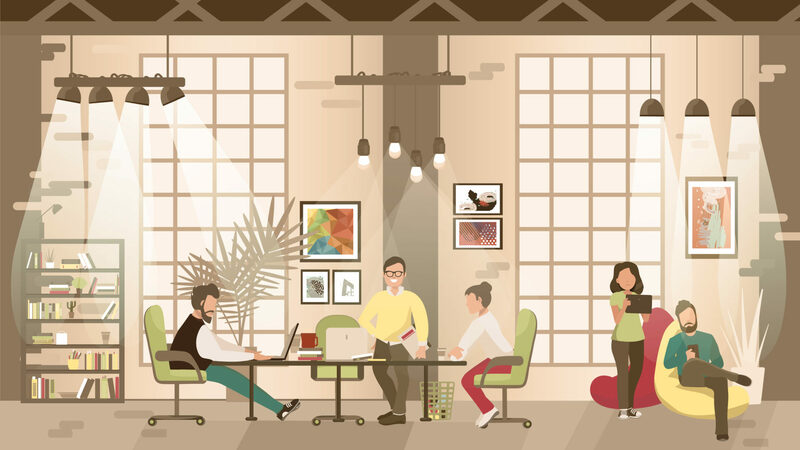 Co-working spaces promote interaction and networking, and help in cutting costs. Many challenges await a beginning entrepreneur, especially if they work individually on bootstrapping. Working from home saves the time and money of commute and is more comfortable, but it also has cons. While working, unexpected problems occur. Dealing with such problems can be over-whelming and time-consuming without the help or assistance of fellow professionals in the field. According to the Huffington Post, 64% of coworkers are better able to complete tasks on time. Teaming up in a professional setting combines valuable unique experiences. Consulting colleagues and taking different perspectives can help workers understand problems better and tackle them more efficiently. Besides getting the daily dose of non-virtual human interaction, a collaborative community sparks innovation and creates opportunity for networking. Co-working spaces are designed to enhance interaction. Entrepreneurs can meet like-minded people who can share insight, and help strategize better. They also find people with different skill-sets like code writers, graphic designers, developers, or even marketing experts. This exposure expands an entrepreneur’s perspective, and also opens a door for future collaborations. Co-working spaces offer workshops to train entrepreneurs to equip them with necessary skills. They also teach how to meet the needs and demands of the digital market. In addition, they organize events and seminars to help entrepreneurs in the various stages, and help turn ideas into functioning startups. Most shared spaces offer reasonable rent packages along with office necessities, such as access to high-speed internet, printers and conference rooms. Entrepreneurs can save up on rent, and still have quiet spaces they can book. This provides an appropriate professional setting for meetings, which are expensive to book separately.